In many respects, the GCSE, first taught in autumn 2015 and examined in summer 2017, still feels new, and throws up new challenges for teachers and pupils alike. In 2017-2018 there was a Maths Hubs pilot project which explored ways of teaching those GCSE maths topics teachers found challenging to teach, and students found challenging to learn. In 2018-2019, this work will continue. 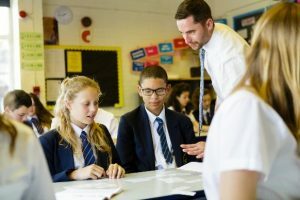 Work Groups will explore effective ways of teaching some of these topics, both to address the immediate needs of the incoming KS4 pupils, but also, crucially, taking a longer-term view by considering development in KS3. The aim will be to get to grips with all the underpinning content of a topic, exploring misconceptions and effective pedagogical approaches for each element. Suitable for Secondary school maths teachers and heads of department. Participants in the 2017-2018 Work Group are welcome to participate again (we will choose different topics to work on). Each Work Group will explore a few GCSE topics in depth, establishing what the issues are and what the common misconceptions are, how these might be addressed through activities and questioning which promote deeper thinking and how teaching in KS3 might be modified or utilised to improve understanding for this topic in KS4.